Davidson and Richmond enter this game with nearly identical records, but vastly different perspectives and momentum. Both teams sit at 6-6 in conference play, and Davidson is 14-9 overall while Richmond is 14-10. While a regular season conference title or an at-large bid are surely out of the question for these two squads, they still have a lot to play for. Finishing in the top half of the conference standings would be a nice accomplishment for two teams who have not reached their pre-season expectations, and it could also springboard a potential run in the conference tournament. This is about where the similarities between the two teams stop, other than the fact that they have already played once this year. On January 25th, Davidson beat Richmond on the road, 78-70. The Wildcats had a nice second half to propel them to victory, however that was not the main story of the game. The crazy statistic was that Richmond somehow managed to shoot 0% from three on 15 attempts from long range. They were able to stay in the game by getting offensive rebounds and making free throws, but that is clearly not a recipe for success. The good news, however, is that it is very unlikely that Richmond is going to have a repeat of the performance, as they are shooting over the national average from long range, at 36.2%. Peyton Aldridge had a career night the first time out against Richmond, and it will be interesting to see if he can pick up where he left off against the Spiders. The forward had 34 points on 10/13 shooting and 11/13 from the line. On a night where Jack Gibbs was off (11 points, 1/8 three point shooting), Aldridge carried the Wildcats to victory. Davidson needs either a similar performance or a much more balanced attack if they want to grab another win against the Spiders. Davidson is coming off of a late game, one point road loss to George Mason, and it will be interesting to see how they respond playing at home. Richmond, the winners of three straight, will carry a head of steam into Belk Arena, where Davidson has only lost 2 games since January… of 2014. 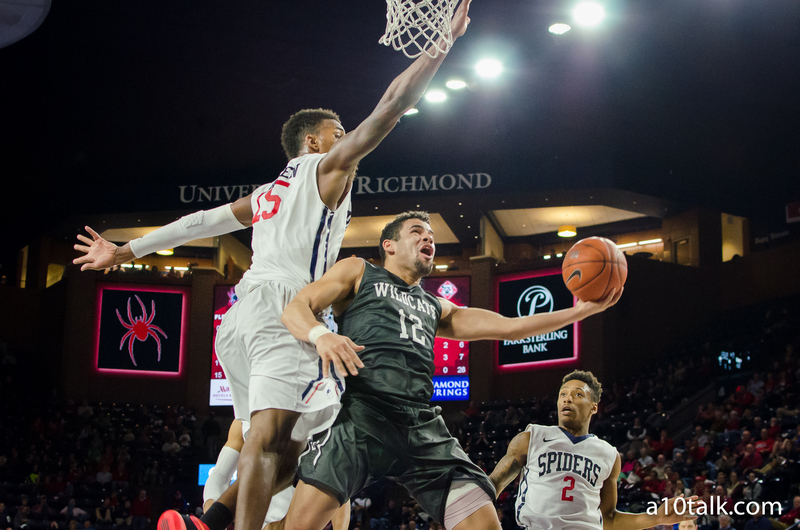 The Wildcats will attempt to find a scoring balance and keep their home momentum alive, while Richmond will continue to ride the hot hands of ShawnDre’ Jones, Terry Allen, and TJ Cline as they try to steal one on the road. Battle of the Rams? Sure, that sounds good to me… but why aren’t Fordham, VCU, and Rhode Island playing for some sort of Ram Trophy? Or maybe even rights to the nickname on a yearly basis? I digress. VCU got off the mat after two losses and crushed Saint Louis, and hopefully will be able to ride that wave of momentum into Tuesday night’s home tilt against Rhode Island. Rhode Island is coming off of a close two point loss against Dayton, and were the winners of two straight before that. They are definitely playing some good balanced basketball at the moment. The starting lineup for Rhode Island is performing very well, with Jarvis Garrett, Jared Terrell, Hassan Martin, and Four McGlynn all averaging double figures over their last three games. VCU has also been aided by balanced scoring, but probably want to see more consistent production from Melvin Johnson, especially from beyond the arc.